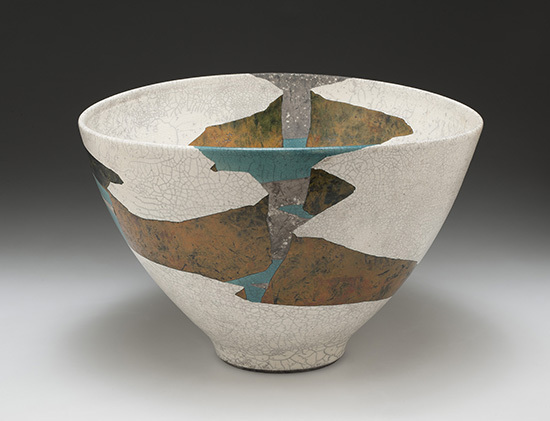 Anyone who has visited the western United States will recognize the imagery of canyons, rock cliffs, and sparkling lakes that world-renowned ceramist Wayne Higby uses as a vehicle for meditating on the intersection of intimacy and immensity. View the above interview with Higby, created by WXXI’s Arts InFocus. Arts InFocus is a half-hour weekly program that champions arts and culture in the Rochester region. Higby gained national attention in the early 1970s for innovative raku-fired vessels based on the Colorado landscapes of his childhood. After a visit to China in 1991, his work underwent a dramatic shift. He began working with slabs of glazed porcelain that continued to reference landscape, but as a focal point of meditation. “I strive to establish a zone of quiet coherence, a place full of silent, empty space where finite and infinite, intimate and immense intersect,” he says. A longtime professor at the NYS College of Ceramics at Alfred University, Higby is currently director and curator of Alfred’s Schein-Joseph International Museum of Ceramic Art. He is the recipient of the American Craft Movement Visionary Award from the Museum of Arts and Design, New York, as well as the Master of the Media Award and the Distinguished Educator Award from the James Renwick Alliance, Smithsonian Institution in Washington, DC. This first retrospective of Higby’s work includes 55 ceramic pieces from 1967 through 2012, including his studies for the largest hand-cut architectural installation in the world—the monumental Earth Cloud wall sculpture at Alfred University’s Miller Performing Arts Complex. This exhibition is organized by the Arizona State University Art Museum Ceramics Research Center, Tempe, Arizona, and curated by former Curator of Ceramics Peter Held. It is sponsored in Rochester by the Mabel Fenner Lyon Fund, the John D. Greene Endowment for Contemporary Exhibitions, and the EDMAC Foundation. Additional support is provided by Charlotte & Raul Herrera, Mary Sue Jack & Richard E. Kreipe, Deanne Molinari, Ron & Cathy Paprocki, and Mann’s Jewelers. Above: White Terrace Gap (1984). Glazed earthenware, raku-fired. Private collection. 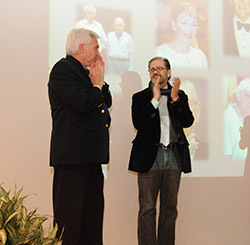 | Above right: In November 2010, when former director Grant Holcomb (at left) celebrated 25 years at MAG, he was presented with a ceramic by Higby (at right). Lake Powell Memory—Silent Rain is now in the Gallery’s permanent collection.